Each month we receive dozens of fabulous reviews and photos from our guests following their stays with us. We then choose the most memorable review and or photo for that month to win a $100 cash card. Our April 2018 Review/Photo of the Month Winner is Dr. Lentini’s chiropractic group that stayed with us at << THE COMMODORE’S MANOR >> for a long weekend. The group submitted a terrific review and awesome photo from their stay. 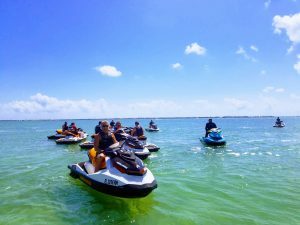 This fun group of Chiropractors enjoyed a day of jet skiing on the Gulf during their stay. 5-star review from the group. We love hearing about our guests’ vacation experiences and seeing these amazing moments. It reminds us how lucky we are to do what we do everyday and to live in such a magical place. We ask our future guests to send us a photo/video of your time on vacation and/or submit your memorable review for your stay to be automatically entered for a chance to win a $100 cash card. 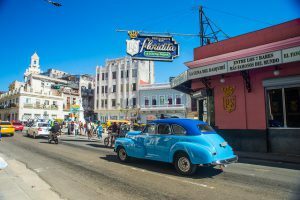 Thinking about adding Cuba to your passport stamps, but not ready to make a commitment to an extended vacation just yet? 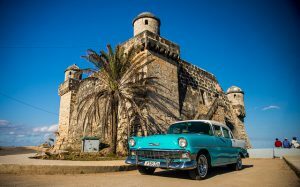 Our concierge has designed the perfect day trip to add “visit Cuba” to your Key West vacation itinerary, allowing you to get a taste of Havana but returning you to Key West by sunset. 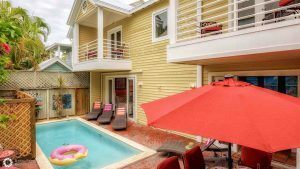 Wake up in your Last Key vacation home in Key West, hop on your semi-private charter flight to Cuba, spend the day exploring and be back in time to enjoy dinner and drinks on Duval St.
TRAVEL: Your day will begin at 7 AM for check-in at the Key West airport. The flight for Havana departs at 8 AM and takes approximately 50 minutes to fly the 90 miles south. EXPLORE HEMINGWAY’S ESTATE: Once you’ve cleared customs, you’ll be met by the local guide and will begin exploring La Finca Vigia (Hemingway’s Country Estate). This is your chance to take a glimpse back in time and see where the famed author withdrew to during his years living between Cuba and Key West – and if you’ve ever visited The Hemingway House in Key West – compare the two monumental properties. Spoiler alert: Hemingway’s famous boat “Pilar” is on site. LUNCH: When lunch time rolls around, you’ll take a pleasant ride into the fishing village of Cojimar for a mid-day meal at Ajiaco for an authentic Cuban meal. While here, get a glimpse of the “Hemingway Bust” the village people erected. 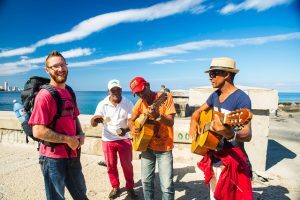 EXPLORE OLD HAVANA: Once you’ve satisfied your appetite, it’s time to explore Old Havana. You’ll have a chance to visit some of Hemingway’s old hangouts: Hotel Ambos, Mundos, La Floridita, the Cathederal, Parque Central, and La Bodeguita del Medio. SHOP: Stop for souvenirs (maybe some authentic Cuban cigars or rum) on your way back to the airport. The returning flight to Key West departs at 5 PM and you’re home by 6 PM. Ready to experience the Key West and Cuban cultural connection for yourself? Contact Last Key Concierge – 305.290.2522 to make a reservation or for additional details. We received a multitude of excellent guest reviews and photo submissions this month! Each month we select the most memorable review/photo received as our monthly contest winner of a $100 cash card. Our March 2018 Review/Photo of the Month Winner is The DeFelice Family, who stayed with us at << AVALYNN HOUSE >> and submitted a glowing 5-star review for their stay and shared some fun photos of themselves enjoying their vacation home and celebrating St. Patty’s Day! 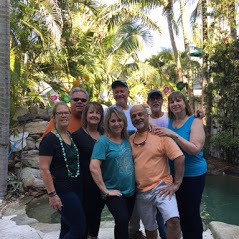 The DeFelice Family celebrated St. Patty’s Day in true Key West style during their stay! The 5-star review submitted from their stay at Avalynn House. The whole gang posing by the pool. It never gets old seeing moments like these of our guests enjoying their vacation homes and time in Key West. We take full pride in providing them with a memorable vacation experience. Future guests: Be sure to send us a photo or video of your time on vacation and/or submit your memorable review for your stay to be automatically entered for a chance to win a $100 cash card. You could be April’s winner! We love receiving reviews and photos from our guests. Each month we select a memorable guest review or photo to win a $100 cash card. The Chambliss Family is our February 2018 “Review/Photo of the Month” Winner for the review and photo submitted for their stay at << COASTAL CABANA >> for the outstanding 5-star review and this adorable photo they submitted from their stay! We thoroughly enjoy seeing these amazing moments of our guests’ vacations. It reminds us how lucky we are to do what we do and to live in such a magical place! For future guests, send us a photo/video of your time on vacation and/or submit your memorable review for your stay to be entered for a chance to win a $100 cash card. 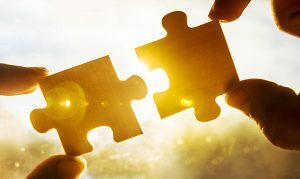 The keys to scoring the best Last Key vacation home fit for your prime season stay are: educate yourself on our policies ahead of time, let us help you find a match, and be prepared to secure your rental. 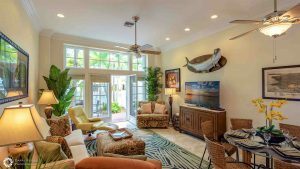 For those prime season Key West vacationers who brave the vacation rental market each year, this is your insider’s guide, created for you by our Director of Marketing & Reservations, so that once next year’s dates become available for rental you are ready to pounce on that vacation home you’ve been crushing on. In order to properly prepare for prime season rentals, it is best to start with the pre-booking policy of Right of First Refusal. We offer the Right of First Refusal to our prime season monthly guests (Jan-April months in relevant homes.) “Right of First Refusal” simply means we try to give current guests the first crack at renting the same home for the same dates the following year before it is made available to the public. Our timeline for this shifts each year, but typically seasonal guests are contacted the December prior to their stays to exercise their bookings for the following season. As an example, in December 2018, guests for season 2019 will be contacted regarding Jan-Apr 2020. What this means for prime season vacation home shoppers is the day following the right of first refusal deadline is the best opportunity to jump on a reservation for the home you have your sights on. 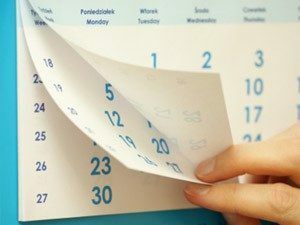 Mark your calendar for the right of first refusal deadline and call our office on that day. Our goal is to host you as our guest in the home that fits your needs. Help us do this by thoroughly communicating what you do and do not like about various homes we discuss in the booking process. New homes join our inventory all year long, so the more we know about you and your search, the better. Just in case the home you’ve been eyeing is unavailable, it’s always a good idea to have other homes in mind. Rank your top choices (1-4) and communicate why you do or do not like options we share, and we can best match you with the right home for your dates. Although our homes are very true to the photos here on our website, we appreciate that many guests prefer to personally view a home prior to confirming a rental. We are available to walk you through any of our rental homes free of charge, as long as the home is not occupied by guests at that time. Not able to come tour a home for yourself? 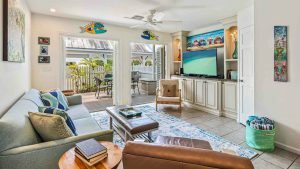 We encourage vacation home “shoppers” to take a look at the reviews past guests have entered on our website, on HomeAway/VRBO/AIRBNB listings, and on Google. Provide our team with as many details as you can about your needs so that we can best consult on the homes in our inventory that may match your search. On the day that homes become available for rental, be prepared to secure yours by knowing what you need – we require a signed contract and a 50% deposit in order to confirm your reservation. Be ready to sign and put down your deposit to lock in your dates as quickly as possible. There you have it, the recipe for how to get the vacation home you want! The prime season months always book up the fastest (a year or so in advance) so do not hesitate to make your plans early. 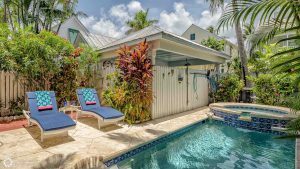 Remember we’re always here to help you plan your next Key West adventure – contact us at rentals@lastkeyrealty.com or call our Office at (305) 292-6266 to speak with a reservationist directly. Feeling lost about how to best spend your holiday? ‘Tis the season to celebrate all of the traditional joys associated with this time of year, with no snow shoveling involved! Key West is the perfect location to celebrate the season with family and friends for a holiday everyone will remember. 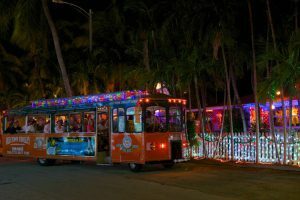 Escape from the cold and experience the holiday season a little differently here in Key West. This Year Shovel Sunshine, Not Snow! The winter chill might be on around the world, but here in sunny Key West you can expect temperatures in the high 70s or low 80s. Sometimes cold fronts bring a frost to the mainland of Florida, but here in Key West we stay frost-free! Rain is uncommon this time of year too so you can expect sunny skies and warm enjoyable temperatures. 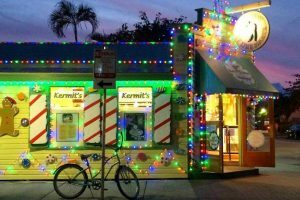 Imagine enjoying a bike ride through Old Town to view the creative talent of Key West locals as they decorate with lights on everything from their homes, to fences, to boats… Palm trees make great Christmas trees too. Santa can even be found snoozing in a hammock or on a front porch. 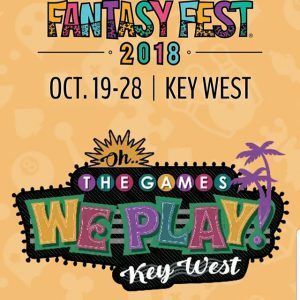 Worried about stressful travel to Key West? Well don’t be, because getting to Key West has never been easier… United Airlines is now offering direct flights to Key West from Chicago and Newark throughout the Holiday Season. Give the ultimate gift of a last-minute Key West vacation to your spouse or family this year! We are currently offering a SUPER special of up to 60% off remaining rentals for Christmas, and we’ve extended this deal for January rentals as well. 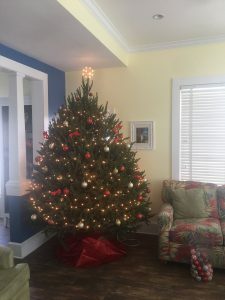 To make the deal even sweeter, our Concierge Team is offering Christmas Tree delivery and set-up, as well as all of the usual services (bike rentals, dinner reservations, fishing trips, etc). Don’t hassle with traveling with gifts, just ship them to our office and we’ll deliver them right under your tree! You are probably not surprised to hear that Key West offers more churches and bars per capita than anywhere else in the USA. For those looking for worship, you can attend a service at any of the many churches and synagogues. For those seeking happy hour and perhaps more, enjoy an eggnog martini or your preferred beverage at your favorite Key West watering hole. FYI Virgilos is open again! 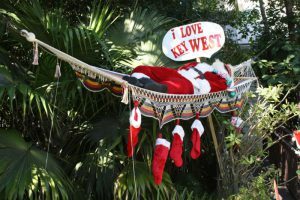 December in Key West means the festive season is in full swing. The island buzzes with magical events for all to enjoy… and lots of lights! Take a lighted trolley to view all the wonderful lights around Old Town. 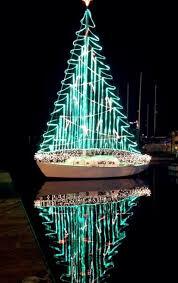 Enjoy the annual lighted boat parade. Take a tour of the Historic Inns of Key West. Ring in the New Year… Key West style! Spend your last nights of 2017 sipping on bubbly in Paradise! Key West is the best place to celebrate New Year’s Eve – watching the famous drag queen Sushi drop from a shoe at 801 Bourbon or the famous Conch Shell drop at Sloppy Joes bar. Duval street is closed to cars for the big party. The best part – sipping champagne in 75 degree weather. We’re also providing special welcome and celebratory gifts to guests staying with us for New Years. Consider spending this holiday season with us in Key West and make a special holiday memory or plan a surprise trip for your spouse or family as a Christmas gift. 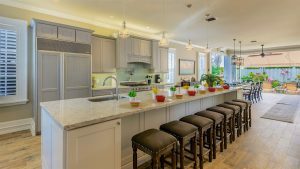 Give us a call at 305-292-6266 or browse our available homes for last minute availability. It’s time to announce our November 2017 Review/Photo of the Month winner! Each month we choose a recent guest who has submitted a great review and special photo enjoying their vacation home to win a $100 cash card. Our winning submission for November 2017 is the Beech Family, recent guests of our at :: THE MELLOW MACAW :: who submitted a stellar 5-star review for their stay, and submitted some fun photos of themselves enjoying their time in paradise. Thanks for sharing! Read the winning review submission. The whole crew having dinner out together! The Beech Family experienced the Super Boat Races during their stay. Future guests are encouraged to submit your 5-star review and guest story photo to be automatically entered into our monthly contest. The more memorable and fun the review/photo, the better your chances of being selected! We are excited to be back delivering our guests a truly memorable vacation experience in Key West. 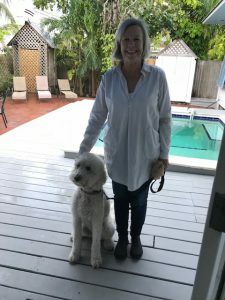 Our winning Review/Photo submission for this month was from one of our first Post-Hurricane Irma guests, and we are so happy that they were able to enjoy Key West to the fullest. 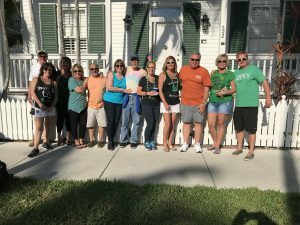 Our October 2017 cash card winner is The Julien Family, who stayed with us at :: CASA VICTORIA :: and submitted an awesome 5-star review for their stay, as well as some fun photos of themselves enjoying the home and their time in Key West. Guests enjoying their time at Casa Victoria. The whole gang at the Southernmost Point. Enjoying some fun on Duval Street. These guests celebrated a birthday while in residence. We are beyond thrilled to be back doing what we love – providing our guests an unrivaled Key West vacation experience. Seeing these amazing moments reminds us how lucky we are to be doing what we do and to live in such a magical place.